I haven’t really made pumpkin cupcakes before, but I have tasted a number of pumpkin muffins and have never really been very happy with them. I decided to use a Martha Stewart recipe as a base – I am rarely disappointed with the recipes on her site – and I wasn’t this time. The cupcakes themselves were surprisingly tasty, moist, and pumpkin-y. I topped half of them with ginger-cream for more of a breakfast treat and filled the other half with ginger-cream and topped them with chocolate ganache frosting. 3. 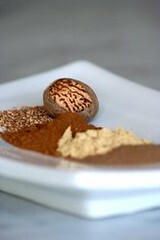 In a large bowl, whisk together, brown sugar, granulated sugar, butter, and eggs. Add dry ingredients, and whisk until smooth. Whisk in pumpkin purée. 4. Divide batter evenly among liners, filling each about halfway. Bake until tops spring back when touched, and a cake tester inserted in the center comes out clean, 20 to 25 minutes, rotating pans once if needed. Transfer to a wire rack; let cool. 2. In a small metal bowl, soak plain gelatin in cold water for 5 minutes. 3. Place the bowl over a small pot of simmering water and stir until dissolved. Set aside to cool. 4. In the bowl of an electric mixer, beat cream until soft and billowy. 5. Slowly drizzle in the simple syrup and vanilla, continuing to whip as you do. 6. Add the gelatin all at once and continue whipping until soft peaks form. 7. 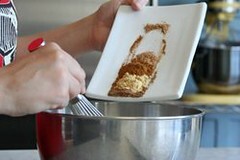 Finish beating with whisk to adjust consistency. 4. Add butter to the chocolate (make sure its soft and at room temp) and stir until combined. 6. 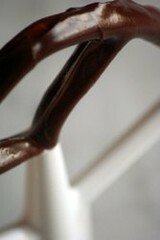 Pour the sugar mixture onto the chocolate mixture, then stir until combined and smooth. 7. Let sit at room temperature until thickened. 1. Using a melon baller, scoop out a semi-circle of cupcake and set aside. 2. Pipe or scoop ginger cream into the cavity. 3. Cut the excess cake off the scooped out bit and cover the cream-filled hole with it. 5. Top with the white chocolate dipped candied ginger or whatever else you have on hand. Yummy! Simply mouthwatering! Love your blog; keep it up! Would try your recipes some day. The photo’s worthy of the MSL!! I am always impressed with your creations! Any hopes of making a gluten-free variety someday? chockylit, did you bake the prescribed 30 cupcakes, or did you make the mini muffin size cupcakes? If so, does the overall baking time change for smaller size muffin tin? 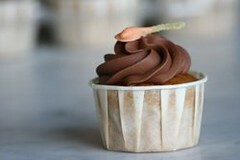 (In you picture the cupcake liners look like the smaller kind). capello, I have totally been thinking about gluten-free, but have been concerned with taste. I was just reading a promising article though, in Gourmet, about a flour mixture that is a promising substitute, developed by Annalise Roberts. It goes as follows: 2 cups extra-finely ground brown rice flour, 2/3 cup potato starch, and 1/3 cup tapioca flour. My plan is t make one of my standards that I have made a million times with this flour mixture and do a side by side compare. I’m excited to see how it turns out! amy, those are indeed the regular sized cupcakes. (I have those containers in 1 ounce and 3.5 ounce sizes.) Generlly regular sized cupcakes take 20-22 minutes and mini 12-15 minutes, depending on the recipe. Hi Chocoylit! I found your blog from Cupcakes take the Cake. All your stuff looks amazing and I can’t wait to try some of those yummy recipes. 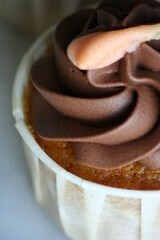 Do you have a cupcake company in SF? I’m looking into opening a little cupcake shop in toronto, Any advice? You should totally go for it though! Thanks for gluten-free baking mix recipe. I haven’t tried any gluten-free baking yet (just found out I have celiac disease three weeks ago). I just tried my first mass-produced gluten-free cookie and I was pleasantly surprised, even though there was a certain odd grainy-ness and crumble to the overall product (but really, what should I suspect from mass-produced foods? Espcially since I make nearly everything from scratch). what an interesting recipe. as usual, the pix are deliciously beautiful. Fabulous recipe!! I made these for a Halloween party this weekend, and brought in a few to work today, and received so many compliments, including “That was the best cupcake I’ve ever had in my entire life,” which came from a devout foodie! Great job, and keep up the great work on your blog! Also, I love the photos (I am a photographer myself). I made these a few weeks back, and they turned out PERFECT. I garnished them with home-made candied ginger. Great recipe and delicious cupcakes! Had trouble with the ginger simple syrup, need to start with more than 1/4 cup water if you want the end product to be 1/4 cup syrup!